Josh Gulbranson at Fraser Yachts sends news of a price drop on his central listing, the 23.5m motor yacht Happy Fish. 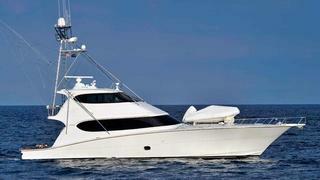 As her name implies, Happy Fish is a sport fishing motor yacht. She was built by Hatteras in 2008. A fine high gloss cherrywood interior sleeps eight guests in a master suite, two double staterooms and a convertible twin cabin while twin 2400hp MTU engines give her a cruising speed of 30 knots. Happy Fish is now asking $3.95 million, down from $4.15 million. She will be on display at the Fort Lauderdale International Boat Show later this month.